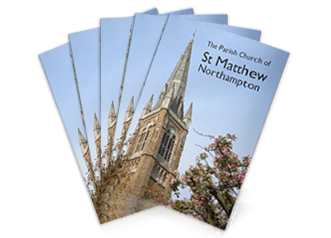 Our brand new guide to St Matthew’s Church is now on sale. A brief history of the church and a detailed tour of the main features and furnishings are illustrated by many fine colour photographs. The price is £3.75 and is available in church or the Parish Office. If you wish a copy to be sent to you, please contact the Parish Office – the price is £5.00 to cover postage and packing (UK destinations).